Ride the West with The Duke! 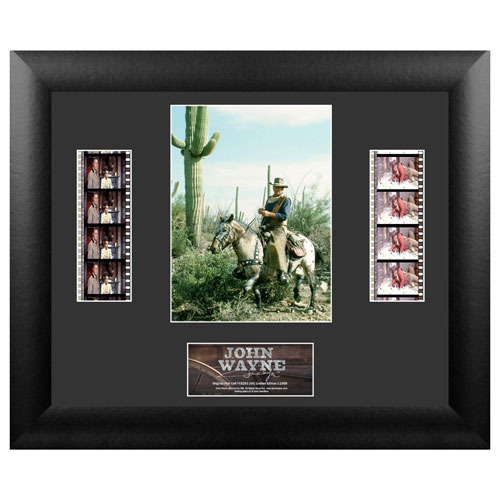 Framed film cell features two strips of real film from a John Wayne movie! Limited edition of 2,500 pieces. Includes a numbered name plaque and certificate of authenticity. John Wayne rides the West on his faithful steed in this beautiful collector's film cell. A limited edition of 2,500 pieces, it measures 13-inches wide x 11-inches tall in a black mdf frame and features two strips of real film from an actual John Wayne movie. Also included are a numbered limited edition name plaque and a Trend Setters embossed/foiled certificate of authenticity. Made in the USA. Each FilmCell presentation is made with careful attention to detail. It's double matted, placed in a quality frame, and contains a clear front and back allowing natural light to enhance the film frames. Each piece of film is hand cut from reels to provide you with the best possible scenes to offer a unique and varied product. All this is combined to bring you a collectible that looks great in any room. Ages 14 and up.